I’ve been meaning to write this post for some time as I’ve had both of these bags for a few months. Two of the more popular bags for Fujifilm, and mirrorless cameras in general are ONA’s Bowery, and The Billingham Hadley Small. I had my eye on both bags during my quest to find a primary carry-bag for my Fujifilm gear. I ended up with the Hadley Small, but the Bowery was added to the roster for my wife who wanted something smaller than most of ONA’s “Shoulder Bag” offerings, in this colour, and that looked even less like a camera, utility or fisherman’s bag. More on that in a bit. Now, had Billingham not released their new Sage Green and Chocolate leather colour combination, I’d have almost certainly ended up with an ONA bag myself. I’m not a fan of black accessories, Billingham’s khaki colour gets real dirty, real fast, and the tan leather makes the bag look much more fisherman-like for me. Once I saw the green and chocolate colour combo though, I knew it was the bag for me. I just had to find one. Billingham aren’t known for having a speedy supply chain. ONA’s stuff was fairly difficult to get in Canada up until recently, but fortunately they started teaming up with Canadian shops recently. I find a comparison of these two brands can be distilled down to form vs. function. This isn’t to say either brands is strictly form while the other is function, just that each brand has a focus. ONA bags are form first, function second, while Billingham are function first, and if you don’t like their styling, tough luck. Fans of either brand are sure to find that statement inflammatory or even troll-ish, but I can back it up. We’ll look at a few different categories and I think you’ll see what I mean. Capacity is directly linked to size of course, and that’s where ONA’s and Billingham’s smaller offerings start to differ. The Billingham is noticeably larger as the focus is on the function of being able to carry more gear. ONA’s focus is on styling, thus, they’ve reduced the overall size of their Bowery for added discretion, and a bag that can easily be mistaken for one that holds no camera gear at all. This results in a surprisingly large difference in carry capacity. I can easily fit my two largest cameras with my two largest lenses attached in the Hadley Small with room to spare and the front pouches unaccounted for.1 Bowery owners will probably want to stick to smaller lenses, or even a single camera body. In addition to size affecting capacity, the two companies take very different approaches with their divider offerings. The Hadley is significantly more customizable as it comes with four separate dividers. This allows for easy and safe lens stacking. The Bowery comes with just one divider. For what the Bowerys cost, a second divider would be appropriate, however, my wife is happy to pack her Bowery with the camera on one side and her stuff on the other, so a second divider isn’t needed. Finally, in the capacity department, we have the pockets. The Bowery sports side pockets that are next to unusable for anything more than a stick of gum or two. Even the front pockets aren’t much better, but you can stow smaller items like batteries, maybe a wallet, and all but the largest phones should fit. Once again the Hadley embarrasses the Bowery with capacity. I can easily drop an X100S in one of the front pockets. In fact, an X-Pro1 with an 18mm ƒ/2 will even fit with pocket fully expanded. I’d advise against this as it offers little in the way of protection. Still, in a pinch, it’s nice to know just how much can be carried, and that the pouches collapse slightly when less capacity is needed. The Hadley also has room enough between the foam insert and the outer shell of the bag to fit an old iPad 3, which is the largest aside from the original iPad. With a Smart Case, the iPad will push up on the top flap a little, but it fits and is fully protected on the side that faces away from your body. Again form vs. function comes into play here. Billingham opt for an ultra-light FibreNyte material whereas ONA stick to leather and canvas. ONA’s canvas bags are actually quite light, but the material is not as light as FibreNyte. Billingham claim a 10-15% weight-savings over canvas, but consider that the much smaller canvas Bowery weighs only 0.1 pounds less than the Hadley small. The “upgrade” to leather results in over half a pound of added weight,2 which results in a Bowery that’s nearly half a pound heavier then the Hadley. This might not sound like a lot, but over time, half a pound on one shoulder can take its toll on your spine. The day I moved away from leather satchels I noticed an improvement in how my back felt day to day. Adding half a pound to a bag that’s only 1.4 pounds to begin with is also a huge increase, and is immediately noticeable when you have both bags on hand. I’d also much rather use that half pound on gear, over bag material. That’s a lens-worth of weight. ONA’s bags are water resistant, but if you want something that’s waterproof, you’ll have to look elsewhere. Billingham’s FibreNyte material is totally waterproof, and while Billingham have done their best to ensure their FibreNyte isn’t instantly recognizable as artificial, it doesn’t have as natural or pleasing a look as real canvas or leather. That last bit segues nicely into the next section. Now we step firmly into the land of subjectivity. Even if Billingham’s bags were indisputably the most functional bag on the planet, nobody wants a bag they think is ugly. Me, I like the English countryside fisherman look in the colours I chose, but if there’s one area you have to hand it to ONA, it’s in the looks department. Their bags look fantastic. If their leather Brixton weighed what a Billingham Hadley Pro does, I’d have one already. ONA also have much more to offer in terms of styling choices, just prepare to open your wallet if you move away from their canvas bags and the Bowery. 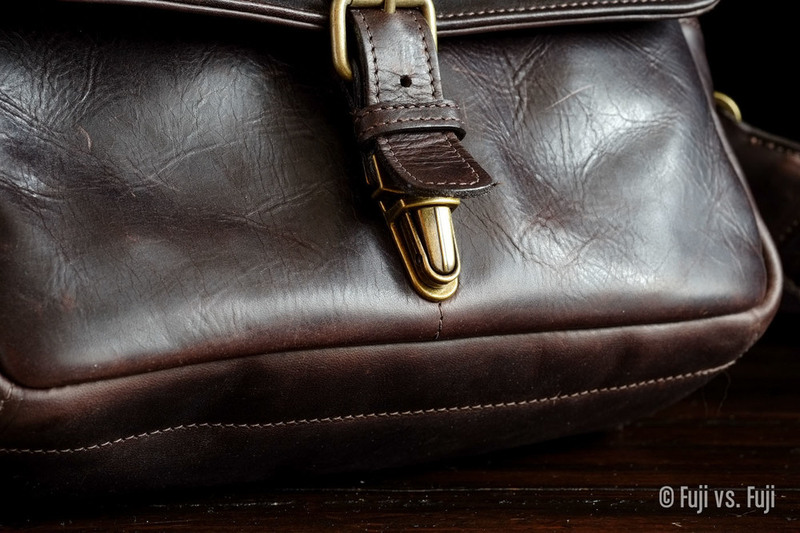 The leather ONA uses is also remarkably stiff when the bag is new. I hope that as time goes on it will continue to soften, but even now it’s still pretty rigid. My wife disliked this enough to mention it too, unprompted. The ONA has pretty quick access to the main compartment via a single clasp. In this respect it’s better than the Hadley’s dual release set up, but the added flap of leather that covers the clasp (more of that form) can be a bit fiddly until you’re used to it. The Billingham once again goes all out function here with its handsome buckles. A second fastener is justified given the size, but it does make accessing the main compartment take a little more time. Fortunately each of the pockets are accessible with just one fastener opened. The Bowery’s strap can conveniently be removed. This is how they can call it a “Camera bag and insert.” Not sure about that one. The problem is this “insert” offers nothing in terms of weight savings outside of the strap. You’d essentially just be tossing your whole, potentially dirty bag in another bag. With the Hadley, the strap isn’t removable, but the insert truly is an insert offering you the same protection, same added capacity over the Bowery, and even less weight. Once again, ONA’s “insert” sure looks better, but Billingham’s is more functional. So what does this all mean? Well, if you like the look of Billingham bags, you’re in luck. They’re super light, waterproof, and pack a ton of gear. They just might be the pinnacle of camera bag function. If you don’t, ONA have lots to offer and their stuff looks awesome. It’s no wonder their bags are featured in all those magazines. If money is the driving force behind your purchase decision, you can’t go wrong with a canvas Bowery. Depending on where you live, the tough part might be trying to find one to buy. Below are some links to get you started on your search.